The world championship in Kiev brought fair results that pleased many, if not most fans. As a fan, I am pleased because two of the gymnasts, who I wrote about back in 2011, Mamun from Russia (ball and clubs champion), and Narkevich from Belarus (as part of the Russian group) became world champions. I liked them a lot back then and I am very happy for them now. Yana Kudryavtseva, on the other hand, was the absolutely uncontested and incomparable world champion. 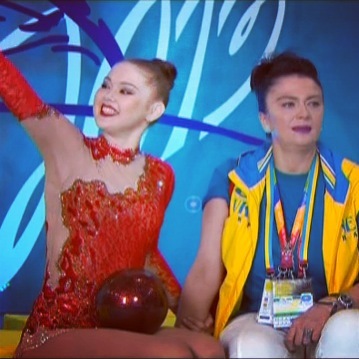 Before her last routine, she actually gestured to the Russian national coach, as if to say, "Don't worry, I'll win it." 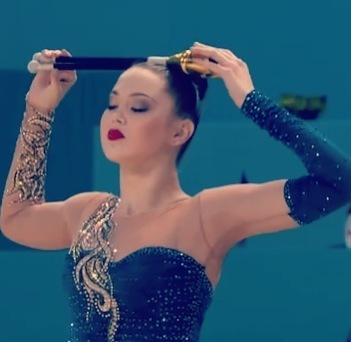 And Alina Maksymenko got a bronze with clubs, too, after numerous errors, small and large, that she made in her other routines. Still, she was smiling the moment she stepped out in front of the audience loves her so much. I don't know if she is planning to retire. I think she is still young and she can work on focusing better and performing cleaner routines. But it seems she thoroughly enjoyed herself anyway. 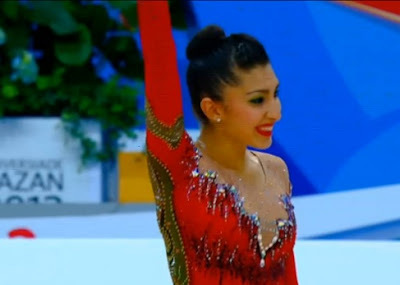 New stars have risen, too, on the world gymnastics horizon. One of them is the Greek Varvara Filiou, who I have really liked lately. She impressed me A LOT during the European Championships, the Mediterranean games and the Kazan Universiade. She placed 4th with ribbon at this World Championship so I hope many medals await her, and overall, a great career full of health and fan love. Congratulations!